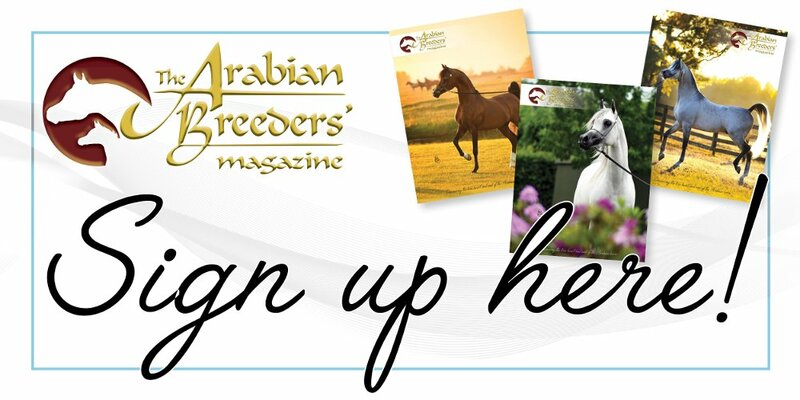 The Arabian Breeders’ Magazine continues to stand out among the many Arabian breed publications that exist today. With its breeder focus, in-depth interviews with breeders and trainers, detailed features on Arabians past and present, as well as educational and health features, The Arabian Breeders’ Magazine is a coffee-table book with substance as well as weight. Breeders and owners the world over are turning to The Arabian Breeders’ Magazine to share their farms and horses and, with The Arabian Magazine offering the complete online package to complement the beautiful print edition, there really is something for every breeder, and every budget. The Arabian Breeders’ Magazine is dedicated to learning, to sharing knowledge, and to returning to the true heart and soul of the Arabian horse – the passion, the history, the stories. This next edition will be available at the Paris World Championships, the pinnacle of the European show season. This issue will include all the usual features as well as a tribute to the great, late stallion Padrons Psyche, a horse who truly deserves to be celebrated. With the most competitive advertising rates in the world, can you afford not to be part of this edition? Our prices start at just £250 GBP (€295 EUR, $325 US) per page, and there is still time to be included in this next issue. The deadline is 20 October, and you can book your space – be it advertising or editorial – by e-mailing info@thearabianmagazine.com or calling +44 (0)1508 536099 during UK office hours.